Download The Mule in Digital HD from the iTunes store. The Mule images are © Warner Bros.. All Rights Reserved. Clint Eastwood (Gran Torino) is an indisputable Hollywood legend. His unwavering career as actor, director, and producer has spanned over 60 years and has produced not only successful roles and films, but iconic ones. 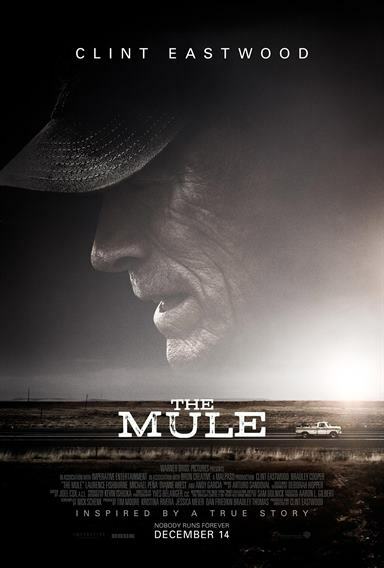 "The Mule", Eastwood's latest project that was released in 2018, is yet another example of his excellence in acting and filmmaking. 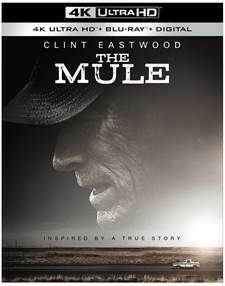 Now, you can add this title to your home entertainment collection with the release of "The Mule" on 4K Blu-ray, available on April 2. "The Mule" is based on The New York Times article "The Sinaloa Cartel's 90-Year-Old Drug Mule" by Sam Dolnick. It told the story of Leo Sharp, who became a drug courier for the Sinaloa Cartel. In the film, Eastwood plays Earl Stone, the character based on Sharp. He is a veteran of the Korean War and a horticulturist who is struggling financially. He is also a man who is estranged from his daughter Iris (Alison Eastwood; Midnight in the Garden of Good and Evil) and ex-wife Mary (Dianne Wiest; Hannah and Her Sisters) due to his always putting his career before his family. With financial pressures mounting, Earl takes on a job as a drug mule. He becomes successful at the job due to the fact that he is unassuming and doesn't fit the typical profile of a mule. He makes good money, pays off his debts and even puts his money to good use in his community, as well as for his family. He becomes an esteemed member of the cartel, garnering the nickname "Tata" (grandfather). However, when tragedy strikes he must decide what's most important in his life and deal with the consequences. Aside from the actors already mentioned, the film boasts the acting talents of Bradley Cooper (A Star is Born) as DEA Agent Colin Bates, Andy Garcia (Ocean's Eleven) as cartel handler Laton, Laurence Fishburn (The Matrix) as DEA Agent Carl, and Michael Peña (Ant-Man and the Wasp) as DEA Agent Trevino. The cast really pulls together the film and creates a superbly acted story that grabs a hold of you and doesn't let go. The Mule is presented in 2160p video quality with a 2.40:1 aspect ratio. While the color palette is rather muted, the details are sharp and clean in this format. The DTS-HD Master Audio 5.1 brings the dialogue from the and center while relegating the ordinary soundtrack to the side and rear channels. Nobody Runs Forever: The Making of The Mule: This behind the scenes feature includes commentary from Eastwood as well as from producer Kristina Rivera, screenwriter Nick Schenk, actors Ignacio Serricchio, Andy Garcia, Alison Eastwood, Bradley Cooper, and other cast and crew members. Overall, this film is just another shining example of both Eastwood's on-screen and behind the scenes talent. If you didn't get out to the theatre to see this film, do yourself a favor and pick it up to enjoy at home.